Every year between the months of June and July, South Africa's east coast is gripped by a strange kind of fever. Keen eyes scan the distant horizon for signs of life; while local radio stations schedule daily updates giving information about one of the planet's greatest natural phenomena - the Sardine Run. The Sardine Run involves the annual migration of billions of Sardinops sagax, more commonly known as South African pilchards or sardines. It has been featured in countless documentaries, including the BBC's Nature's Great Events; and has been the subject of extensive research. Despite this, very little is definitively known about the mechanics of the Run, or why it happens in the first place. What is certain is that the Run begins every year after vast shoals of sardines spawn in the icy waters of the Cape's nutrient-rich Agulhas Bank. After spawning, the majority of the sardines move north along South Africa's west coast, where the waters are cool all year round. Here, conditions are perfect for the sardines, a cold-water species that can only tolerate temperatures lower than 70°F/21°C. South Africa's east coast, on the other hand, is washed by the much warmer, southward-flowing Agulhas Current. However, every year between June and July, the cold Benguela Current pushes northwards from the Cape, creating a narrow channel between the coast and the warmer water offshore. In this way, some of the sardines from the Agulhas Bank are able to travel up the east coast as far as KwaZulu-Natal. The fish move in huge shoals, hemmed into the coast by their instinct to seek safety in numbers and their inability to cross the barrier between the Benguela and Agulhas currents. Sometimes, these shoals can measure as much as 4.5 miles/7 kilometers in length and 100 feet/30 meters in depth, and legend has it that some are even visible from space. 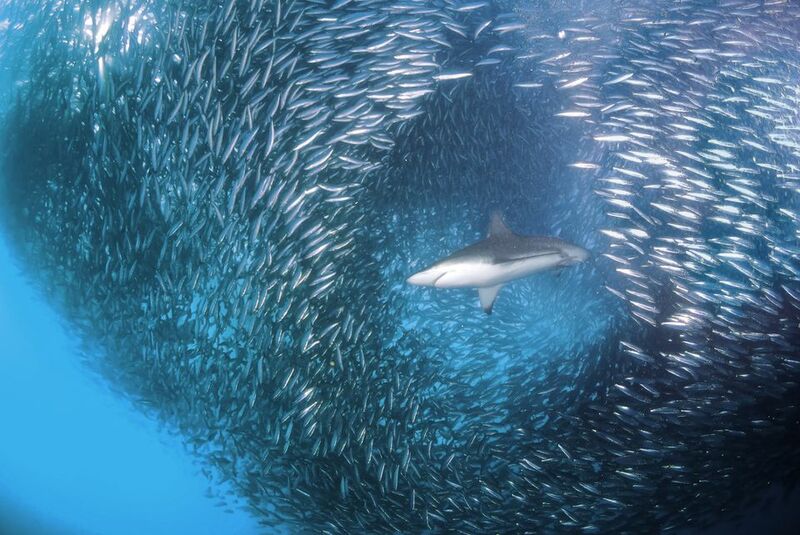 Once the dolphins locate the sardines, they work in tandem with the gannets to herd the fish, separating them into smaller shoals known as bait-balls. Then the feast begins, with birds and dolphins picking off the harried sardines at will, attracting other hunters in the process. Typically, these include copper sharks, bottlenose dolphin, and the mighty Bryde's whale, which often consumes entire bait-balls in a single mouthful. Humans also eagerly anticipate the Sardine Run bounty. While fishing fleets are busy offshore, locals living along the coast use seine nets to catch thousands of sardines as they enter the shallows in search of food. It is thought that the survivors release their eggs in the warm waters of KwaZulu-Natal, leaving them to drift back southwards, all the way to the Agulhas Bank where they hatch the following year. The best way to experience the Sardine Run is from the water, and indeed, it has become a bucket list event for keen scuba divers and underwater photographers. There's nothing quite like the adrenalin rush of watching as a bait-ball gets depleted by sharks and dolphins in front of your eyes, and you don't have to have a scuba certification to do so. Many operators offer freediving or snorkeling trips as well. For those that don't want to get wet, much of the action can be witnessed from above the waves. The Sardine Run coincides with South Africa's annual humpback whale migration, and boat trips offer the opportunity to enjoy the whales' acrobatics whilst also keeping an eye out for dolphins and seabirds. On land, beaches like Margate, Scottburgh, and Park Rynie become a hive of activity whenever the sardine shoals pass by. *It should be noted that whilst the Sardine Run traditionally occurs every year between June and July, a combination of factors including climate change and overfishing have made the Run increasingly unreliable. Those that plan a trip around the Run need to be aware that sightings are not guaranteed, and that activity varies greatly from one year to the next.